Search for all "ITIH1 / IGHEP1"
Rabbit anti Bovine, Human, Mouse, Porcine, Rat ITIH1 / IGHEP1. KLH-conjugated synthetic peptide encompassing a sequence within the center region of human ITIH1. The exact sequence is proprietary. Shipped at 4°C. Upon delivery aliquot and store at -20°C for one year. Avoid freeze/thaw cycles. Liquid in 0.42% Potassium phosphate, 0.87% Sodium chloride, pH 7.3, 30% glycerol, and 0.01% sodium azide. 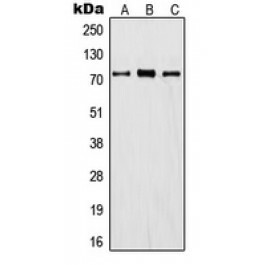 Recognizes endogenous levels of ITIH1 protein.